Social media is a hugely important aspect of digital marketing. FACT. It is still quite new and can be complex at times, however it needs to be something your business is investing time in. It is the modern version of word of mouth. But why should I invest time in social media for my business? I don’t know about you, but I like to use my social media profile to stalk people. I know, sounds a bit creepy, but it is just human nature to be a little bit nosey and try and take a peek into the person’s life, and try and decide on a personality type… It’s the same for businesses.The professional name for this is micro-moments. Having a frequently regulated social media page is vital for capturing micro-moments. 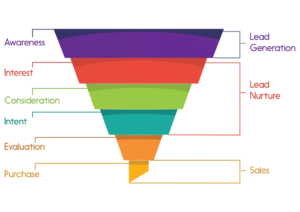 Social media is the most effective in the ‘awareness’ and ‘interest’ stage of capturing leads. You have a few seconds to create a good impression on social. Increasing your brand recognition, and getting your brand name out there is obviously a good start. Anything that helps spread your brand name and increases your visibility is valuable. It helps your business to become easily accessible for your clients, and for potential new clients. Using social media helps to develop a voice for your brand through generating new content. For example, an avid Twitter user might learn of your company for the first time by stumbling across a retweet, leading to curiosity of your brand. Without knowing you have built up a relationship with a potential customer by them ‘stalking’, which might lead to a purchase. OR, a customer might feel better acquainted to your brand by seeing it a couple of times on various networks. Type your favourite brand in to any search engine. More often than not, the social media profiles should pop up along with the official website. If you are ranking for not only your website but your social profile as well, then you are occupying valuable space in the search engine results pages (SERPs). In order to succeed with this, you need to make sure all of your social accounts are active constantly. According to Moz, external links and the authority of the websites that link to your site. When you’re using social media to share and promote your content, you begin to increase the likelihood of other websites referring and linking back to it. A really strong positive for social media is that you can build relationships via direct communication. We see it happening with celebrities and their fans, why would this be any different for business? Social media is a direct way for viewers to send direct messages to the company, with a complaint/question/praise/appreciation. You are also subject to customers feeling customer satisfaction. Win attention by communicating and engaging with customers as it could result in more conversion opportunities. Your aim should not be to make a sale and then never hear from the client again…It should be: to build a relationship, make a sale obviously. whilst understanding queries, working together and in turn they will become loyal to you. By sharing valuable content, your followers have a good reason to stay loyal to you. When you create a social media account, it is completely bare. 0 posts, 0 followers and 0 following, which forces everyone to start on the same level. However, money enters the equation for some of those brands with bigger budgets, some people believe that buying likes and followers might help get the ball rolling on social. In some cases this might work, but at the end of the day earned likes and follows are often more valuable. Social media does allow the smallest of businesses to compete with the big brands, but it comes down to planning, content and time. Social media is not a limited product, you can share what you want people to see and create a personality around your business. A customer sees these platforms as service channels where they can directly communicate with the business. Something which is also important to note is, a lot of businesses don’t see the advantage of using social media…Those businesses are missing a trick and allowing competitors to sweep in and take the floor.